Mr. Power was struggling to breathe and he wisely told the folks in charge of the tour that he needed to get to a doctor. His only job now was to keep calm—and keep breathing—while making his way to the nearest of Yellowstone’s medical clinics. The staff at Old Faithful Clinic attended to Mr. Power as soon as he arrived, anxious to monitor his heart and track his oxygen saturation levels. They was a possibility of cardiac stress, and they were concerned about hypoxia. Commonly referred to as altitude sickness, hypoxia is the oxygen deprivation that occurs when someone moves to a higher elevation faster than their body can acclimate. It can lead to potentially fatal complications like fluid accumulation in the lungs and swelling of the brain. When the clinic staff saw Mr. Power’s EKG, they were very concerned; their patient needed specialized care beyond what they could offer. With no time to waste, doctors requested a helicopter. This is where REACH entered the story. Named 2015 Program of the Year by the Association of Air Medical Services, REACH has nearly 30 years of transport experience and has completed more than 100,000 successful patient transports. Within minutes the flight crew at REACH 24 in Bozeman was headed their way. On board with pilot Dillon Kundert were Flight Nurse Jeff Myers and Flight Paramedic Jacob DeVries. In just over half an hour, they would have Mr. Power on his way to Bozeman Health Deaconess Hospital, a certified Level III Trauma Center. The REACH 24 aircraft outside of Bozeman, MT. The REACH 24 aircraft in flight. REACH has as its mission, “In every situation, do what is right for the patient.” Their transport teams provide the same compassion and urgency in every critical care situation. One of the most critical areas for immediate access to air transport is scene calls, where severe injuries are the result of automobile accidents, hunting mishaps, natural disasters, etc. 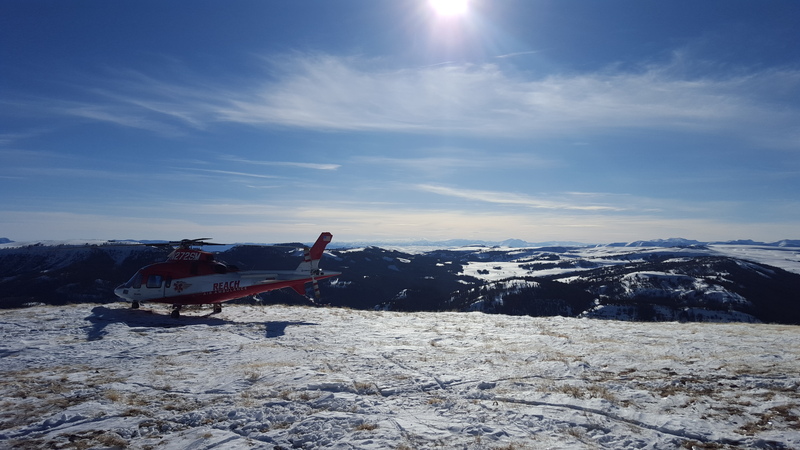 In some areas of Montana, a critically injured individual in need of specialized care but without the option of air transport may have to travel by ground for up to two hours. Mr. Power’s swift recovery and continuing good health is the best part of the story, but there was more great news to come. Elizabeth says they weren’t sure how they were going to cover the cost of their air medical transport. At one point she thought, ‘I wish this happened in Louisiana where we have Air Evac Lifeteam membership.’ Air Evac Lifeteam is an AirMedCare Network provider, just like REACH. With more than 2,000,000 members, AirMedCare Network is the nation’s largest air ambulance network. All members are covered for out-of-pockets expenses when flown by REACH or any of 240 participating providers across 32 states. The Powers were very happy to hear the cost of their transport was covered by their membership—and all they have to do now is plan their next vacation. REACH is humbled by and grateful for this evidence of trust and support. We feel fortunate that we could contribute to Mr. Power’s successful outcome.